Let’s face it, we could all do with something comforting to get us through January. With the media at saturation point with cleanses, diets, detoxes and exercise DVDs, we tend to approach the beginning of the year with a heavy heart full of guilt and self-flagellation. Let’s take a more cheerful approach…. While I wholeheartedly agree with the notion of perhaps reining it in a bit after Christmas, it really is the most miserable month in which to deny oneself a little TLC. My Sticky Gingerbread will surely hit the happiness button and couldn’t be easier to make. You don’t even need a huge slice, just a little can suffice for that wintery spicy flavour. Pre-heat your oven to 160C/140C fan/Gas Mark 3. Lightly grease and line an 18cm round cake tin, spring release is best. Finely chop the crystallised ginger and leave to one side. Blitz the prunes in a blender, or finely chop, and add to a large pan, along with the golden syrup, black treacle and brown sugar. Melt these gently stirring together. When all these ingredients are melted together, add teh ground ginger, mixed spice and chopped crystallised ginger and stir well. Mix together the eggs and milk a bowl, and then stir this into the ginger batter. Carefully and thoroughly fold in the flour. Pour this mixture into the greased lined tin and bake for approximately 50 minutes. 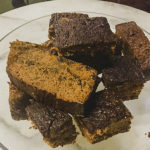 It should be gloriously moist and sticky with a ginger kick, but use a skewer or cake tester to check it is cooked in the middle - it should come out clean with no raw mixture! However, I’m also aware that many of you are experimenting with Veganuary – I’ve jumped on the bandwagon and have signed up for the Arbonne 30 Days to Clean Living – I need to avoid gluten, dairy, alcohol and sugar!! Try the energy balls that I’ve been making, recipe courtesy of the gorgeous Annabel Wade (Arbonne consultant near Swindon). I swear by half of one of these as a pick me up when I need a sweet snack without the guilt, they are truly a revelation. Soften the dates in water for 15 minutes then blend together all of the ingredients except for the coconut oil. Melt the coconut oil and add it to the mixture. Shape with your hands into round balls and leave them in the fridge to set. And finally, so many of our friends and family have been suffering from different strains of flu – Aussie, French, Japanese – and it has left you all feeling completely wiped out. So I thought I’d share my flu-busting soup to both keep it at bay and also make you feel so much better if you’re feeling under the weather too. 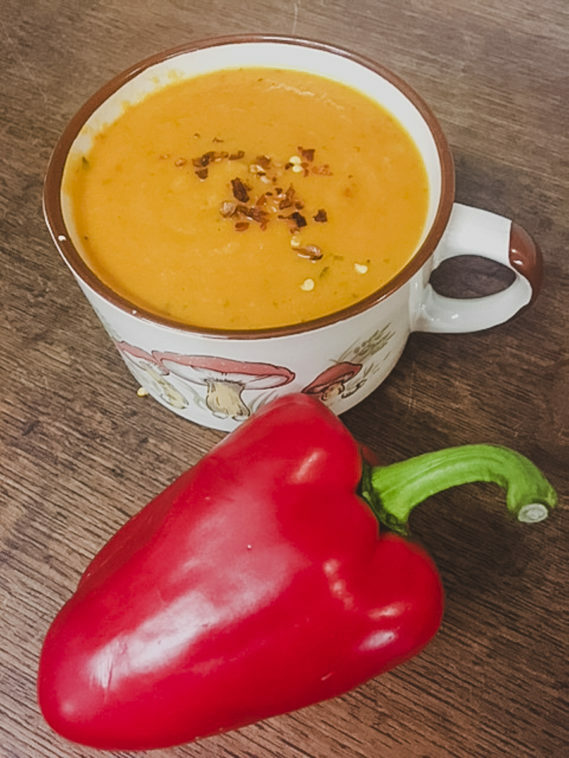 A beautifully vivid and spicy soup that will perk you up in no time! Put the onion, chilli, garlic and ginger in a large saucepan with the olive oil. Cook over a medium-high heat for about 5 minutes, until the onion softens. Add the sweet potatoes and mushrooms to the pan along with the goji berries. Stir well, then add enough vegetable stock to cover all the ingredients. Simmer well for 10-15 minutes, until the potato is soft. Season with salt and pepper. 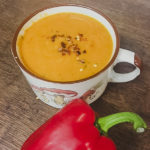 Carefully add the soup to a jug blender in batches, and blend into a smooth, vivid orange, spicy soup. By the way, the snowdrops are out – February will be full of delicious treats as we edge closer to spring… so don’t lose heart! !